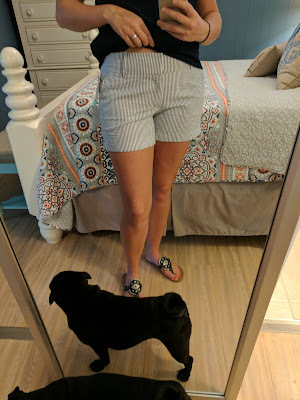 I got my best Stitch Fix ever. Well, only iced coffee. My dad drinks an entire pot every morning, and completely black - and I've always been repulsed by it! I have to blame my little brother for this one. We babysat my nephew together one day this summer, and on our way to a free museum we popped into a local coffee shop. He ordered me an iced coffee because I was dying of thirst by that point. I hesitated, but ended up really enjoying it. In fact, I slurped it down really quickly. Then he helped me figure out what to order at Starbucks to get a similar flavor, and I'm obsessed. 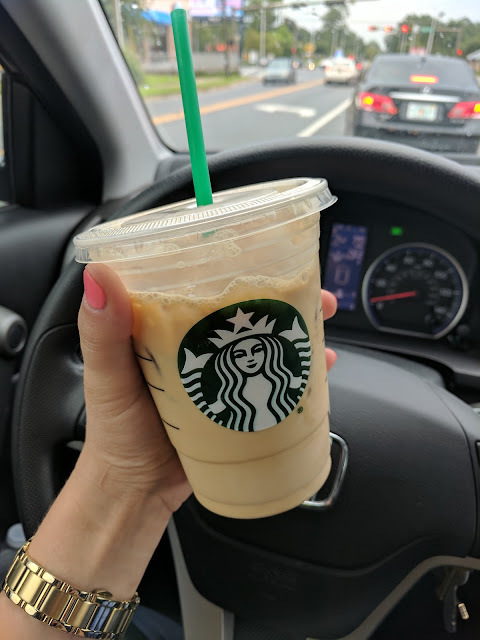 I've ordered so many that I got to Starbucks gold level in a matter of a few weeks and I'm not sure if I should be proud of that or ashamed. This is what I got in my latest Grove shipment. 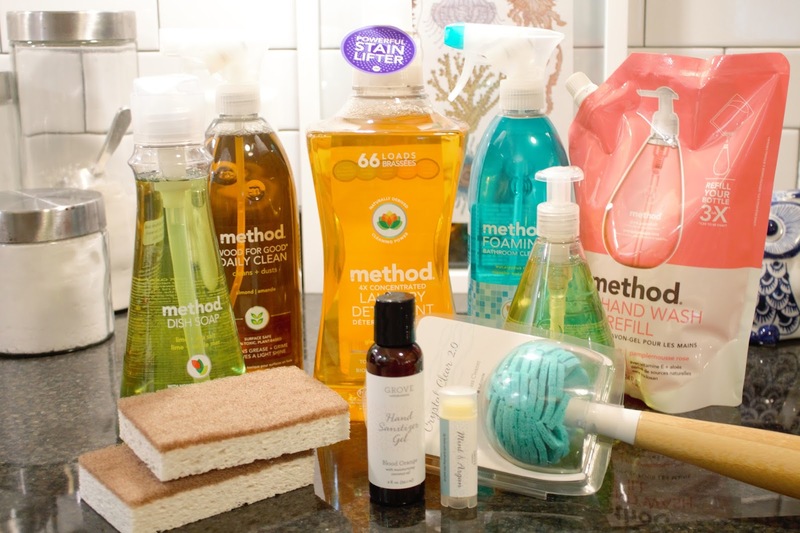 I did not think I was going to love getting my cleaning products from Grove so much! It's so nice not to have to add this kind of stuff to my grocery list, and also great to have to not store bulk supplies in my limited cabinet space. This is what I got in my latest shipment...obviously I love Method! That hand sanitizer gel and lip balm were free! My mom was supposed to teach me to sew ages ago, but we never got around to it. I've always wanted to learn! 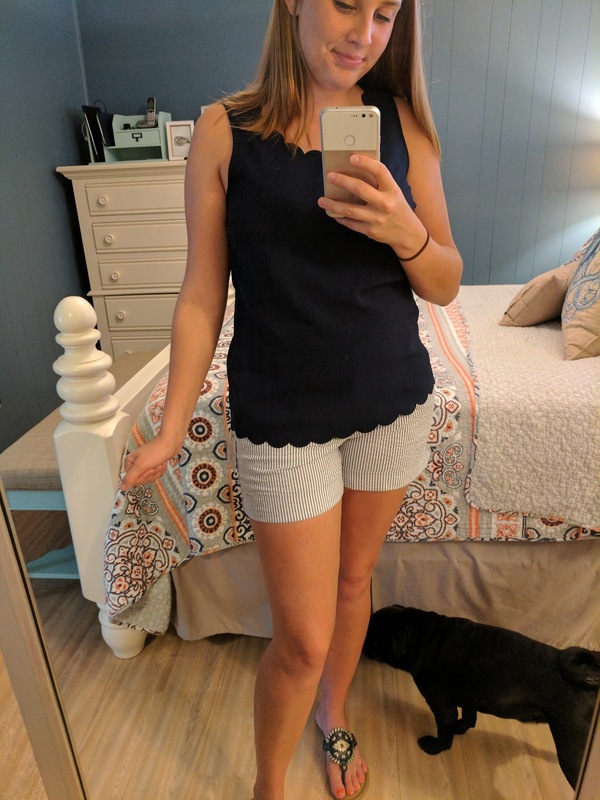 A friend of mine has been making the cutest clothes for herself and grandkids and when I expressed interest in learning she was so excited to help me. 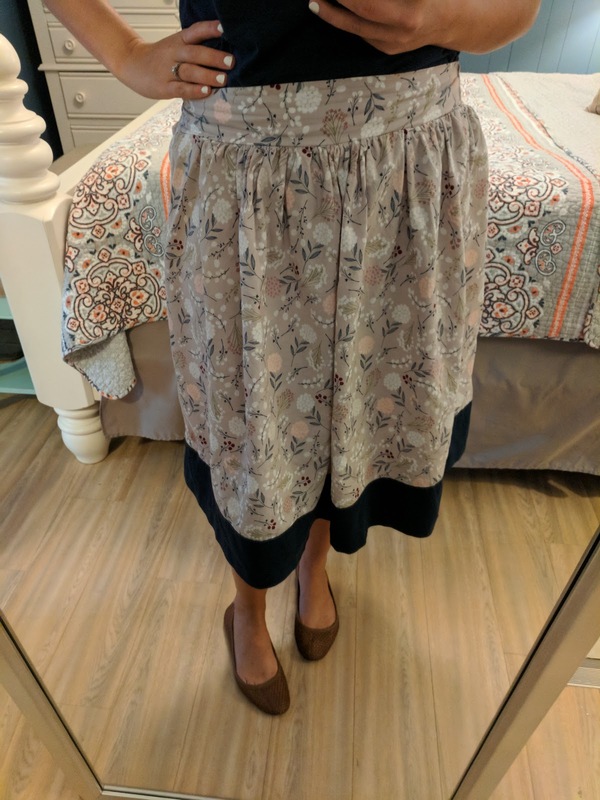 Before I knew it I was buying some fabric at Hobby Lobby and within 2 afternoons I made a skirt! She helped me a lot, but she also let me mess up a lot! It's not perfect, so don't look too close. I'm really proud of it though and we are already talking about our next project. This isn't the best picture, but hopefully you can see the gist. I learned to sew in a zipper, I learned how to put in an elastic waist and I learned how to do that gathering at the top. We made 2 excellent recipes recently. 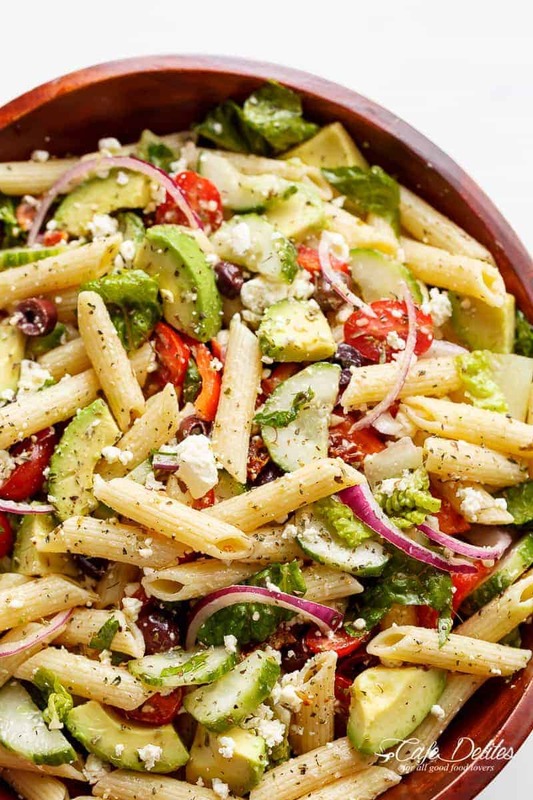 I've been a vegetarian for a solid month now, and it has been such a cool shake up to our meal planning each week. We still definitely do taco night at least once a week, but I've been on the hunt for new easy and tasty recipes too. These two recipes were real winners and many of you asked me to share what we've found! Both were incredibly delicious and we will be making both again, often. Leave a comment below and let me know what's going on with you! I did a Turbofire video after work at my parents house! I love these videos! It's cardio, but you can really feel your muscles engaged. My fitness watch stinks at picking up when I do more stationary workouts so I'm guessing on the calories burned. I almost didn't get up to go to this class, but you never regret it if you do! This class goes by really fast because it's circuits, tabata style. So basically you alternate 2 exercises for 30 seconds with a 30 second break in between, and then move on to another set of 2 exercises. We did 9 circuits and I think we hit every single muscle group. My abs were screaming! This is a local studio really close to my house and it's cheap, but everytime I go in there I want to clean it. I try to remember to bring my own yoga mat and gloves-all their equipment is pretty worn out. But again, it's close, cheap and a great class. Wednesday was a very busy day so to squeeze in something active, I asked Blake to go on an evening walk with me before we made dinner. This is absolutely one of my favorite things to do together! We always have the best conversations on these walks. I had an extremely socially exhausting day, but somehow I can talk to Blake for hours and never feel drained. We live right in the middle of a perfect 2 mile block of sidewalks that a lot of people use for exercise. We always see friends out walking or jogging, and usually get honked at by people driving by. Small town life in a nutshell. This class is different every week. Essentially we work out our entire bodies, but I think each week the instructor chooses a different body part to really pick on. This week was most definitely legs! Tons of work with the kettlebell, wall sits, and lots of box jumps. My legs were jelly after 10 minutes, and it's an hour class! Also, I finally figured out what to set my watch on during these types of workouts! 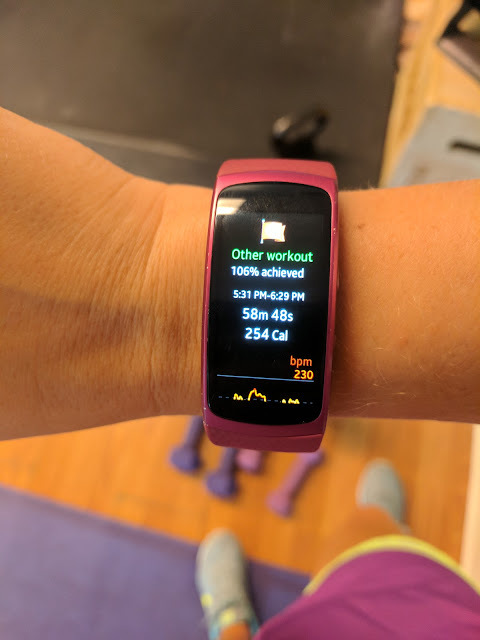 Funnily, I don't really like purple all that much, but my outfit was purple (down to the socks), I chose a purple mat, and all of my hand weights were purple. And, by rest day, I mean I had 2 cleaning jobs in addition to my 9-5 job. Early morning and late night! 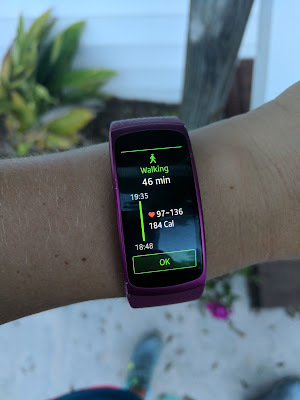 I do think I burn a good amount of calories doing cleaning, but I need to record it next time. I set my alarm to get up and do an early workout on Saturday morning, but when I woke up my legs were killing me from Thursday's class. I didn't want to risk an injury, working out on such sore legs. And I really could use the extra hour of sleep, so I went back to bed! But, it was an active day nonetheless! I single handedly painted our master bathroom in the afternoon- which is definitely a physical activity! 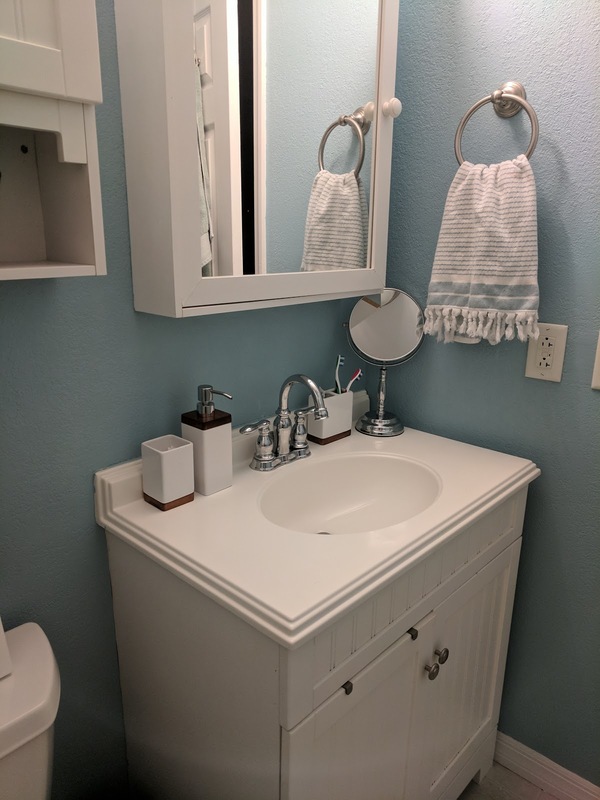 More about this little makeover soon! 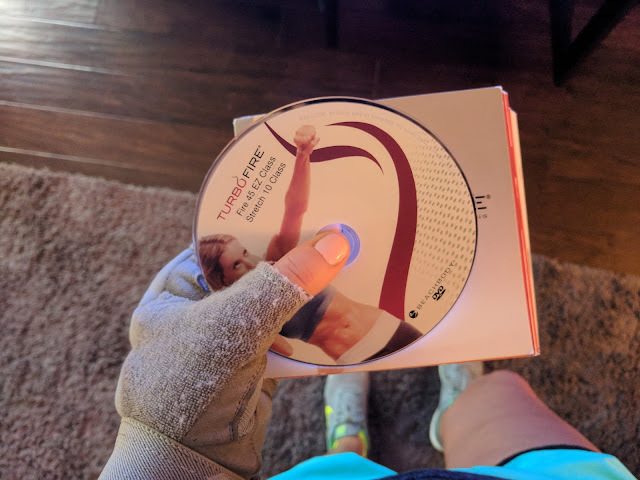 Leave a comment below about your favorite type of workouts! Are you a living room warrior, or do you brave the gym? I really like classes, do you? And how often do you workout and how often do you have rest days? Essential oils are kinda trendy right now, but I am totally on board. When I started developing sensitivity to scents it was the perfect solution for me. I just wanted my house to smell good without giving me a headache! Although there are a million uses for essential oils, my favorite thing is just diffusing nice blends that make me feel good and my house smell better! 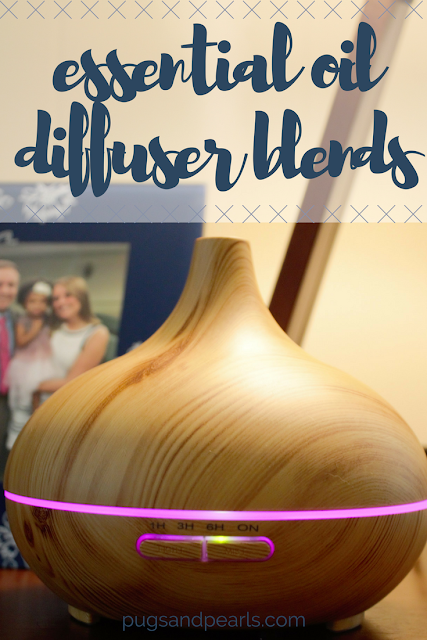 Today, I thought I'd share a few of my tried and true diffuser 'recipes' and I hope you'll tell me what you like to diffuse too! When it's time for bed. One of my absolute favorite part of my evening is starting the diffuser. It's so calming and it helps me unwind. Plus, the scent is now part of my routine and actually triggers sleepiness. I swear I sleep better too. When I need cheering up. When I have a stuffy nose. Sometimes I will use this blend at night because I wake up with a stuffy nose all the time. Side effect of sleeping with the fan on...but we live in Florida soooo not gonna change. This mixture of oil really does help with congestion. When I have a headache. When I need to focus. Historically when I sit down to read a book, I fall asleep really quickly. My body just notices it's sitting still and that's it. But, sometimes I actually want to read! Especially when I am doing Bible study, I want to be really focused. Now Essential Oils has a few blends that I love, and it's easy because they are already concocted for me. Mental Focus is outstanding, but I will include it's ingredients here in case you want to make your own. When my pugs make my house stink. I love my pugs, but I hate having a house that smells like I have 3 of them. My absolute favorite scent to diffuse is another Now blend called Clear the Air . It's minty and fresh and I love it. It's what is in my diffuser 75% of the time and I have gotten many compliments on it from guests! Again, I will include the ingredients here in case you want to attempt it yourself. Leave a comment below if you are into essential oils! Tell me what you like to diffuse and what your favorite blends are. Are there any scents you don't like? 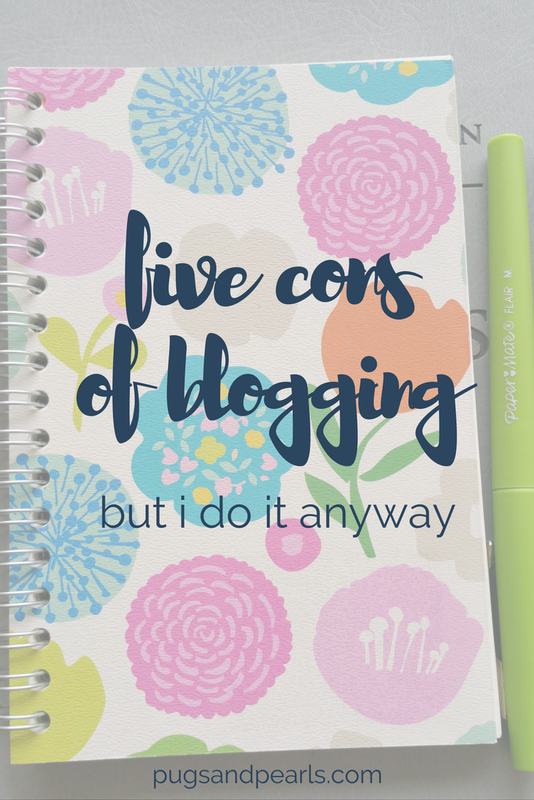 Five Cons of Blogging - But I do it anyway! People know more about me, than I know about them. A handful of my real life friends are regular readers of my blog, and because of that they are very up to date with whats going on in my life. The problem is, it's not a two way street! They may know everything that's going on with me, but I don't get the same benefit. Because of that I often feel out of the loop! I don't want to share everything. That may sound super strange coming from a blogger, but it's true. I still want some sort of anonymity. I'm happy to share most things here on my blog, but I still like to keep my Facebook and Instagram private and just share certain things with people I know personally. That goes against a lot of blogging advice, and hurts my social engagement opportunities-but I don't care. It's important to me to keep some things personal. Random emails for free advertising. Part of blogging is the sponsored post world. I have done a handful of these types of posts, and will in the future. It's definitely a perk of a being a blogger! Who doesn't like free stuff?! There is a tricky type of company who will reach out to me (frequently!) wanting to collaborate on a post. Great. But, then when you start to read the fine print they just want you to mention their company, product or share their graphics-with zero compensation. I'm not just going to advertise for you for free people. There are times when I will specifically mention a name brand or product, without being sponsored. But that's only when I really really love something and it's worth sharing. Not because you asked me to name drop. Sometimes you aren't feeling very inspired. For some reason I will get incredibly inspired and type up a dozen posts and then a few weeks later have to scrape the bottom of the barrel for a post idea. I have no idea why this happens, but I really try to ride the inspiration wave and crank out as many posts as I can when it hits me. There are things I have learned spark my creativity, so I'm working on tapping into that when I need to. I don't like feeling pressured to have everything look perfect. I often find myself hesitating to share outfits because I don't have a full head-to-toe new look that I can link to. (The reality is most of my clothes are from Ebay!) I feel like any pictures of my house or meals need to look flawless. That means I angle the camera just right and usually let my food get cold before I eat it. Honestly, my favorite posts to read are the real life/behind the scenes style and I know other people feel that way too-so I'm not sure why I feel this way! Leave a comment below if you feel the same way! I'm curious to see what other bloggers have to say about the negative side to blogging, and what non-bloggers see from the outside! Our Annual Beach Trip & Our First 'Vlog'! We wanted to document our stay a little differently this year, and so we attempted our first 'vlog'. I absolutely love watching vlogs on Youtube, so I thought we could try it out. We used our cell phones, a small tripod and a time lapse app to do the whole thing. Blake did all the editing, with a few tips from me along the way! It turned out so cute, and I just smile and smile watching it. Unapologetically, most of the clips are of my niece and nephews. I tried to get a few shots of things I love most about the trip-playing cards, taking turns cooking, and trying not to burn your feet on the lava sand when you bring your pina colada down to the beach! One of my favorite things about blogging is that you get to look back on some really cool things! I know I've taken a lot more pictures in the past few years just to post here that I may not have taken otherwise. Most of the time I like to keep it pretty positive around here and share the good things that I've got going on. Interestingly, I was cleaning out my draft folder and noticed a post from early June 2016 that caught my attention. It was really just a bunch of venting, and I think I felt better after I typed it all out and never felt the need to hit publish. Sadly, it was a cry for help and I was so deep into my stress that I didn't even see it at the time. Every year around spring and the beginning of summer I start to get bogged down by our daunting schedule and to-do list. We almost always have things on the calendar, but it's downright crazy how much we've got going on this time of year. The yard starts needing attention, baby showers, weddings, graduation parties...it all seems to pile on. On top of that I've got work, cleaning jobs and volunteer work to balance. By the time I get home I don't feel like cooking or cleaning or doing anything but hanging out on the couch. That completely conflicts with my obsessive personality and I just end up feeling guilty all the time. I'm not giving anything 100% and that feels so wrong to me. Something has to give though. I'm feeling burned out and not excited about anything. For example, I know I will feel relief when we go on vacation, but I also feel like there are 100 things I will be neglecting at home. So I'm excited to go, but also not excited about the consequences of leaving things unattended. Ironically that was just the beginning of the most stressful summer of my life. It is true that spring and summer do tend to be our busy seasons. But, I did NOT feel the same way this June. And that was completely purposeful. Obviously, I had no idea how to fix the situation at the time, and I kinda feel bad for my past self! Hindsight being what it is, I know now what the problems were and it's pretty cool to be on the other side of it all. Basically, we weren't keeping it simple. I mean, we thought we were. Some of the stress in my life was unavoidable, but quite a bit of it was self imposed. With so much on my/our plate, any extra thing that came up was going to be a huge problem. Which is why that summer was very difficult. Adopting a pregnant dog, remodeling a bathroom, discovering I had a blood sugar problem, losing the A/C in my car in the dead of summer...Had we been keeping it simple, when one of those things came up it wouldn't have been such a big deal. I obviously thought I had already done that in the post I had started writing. But the truth is I wasn't ready to make any changes. I thought I could keep doing it all and not have to give anything up. But, when you have no wiggle room, something has to come off your plate. Deciding what that was going to be was really difficult and involved a lot of sleepless nights of prayer. This may be something that isn't universal, but I felt guilty about having to take some things off my plate. I wanted to do it all and I still struggle with perfectionism on a daily basis. But there is the beautiful illustration of the gasoline truck still needing to fill itself up with gas. It's completely fine fix yourself before you can help others. It just took me a little while to feel okay doing that. 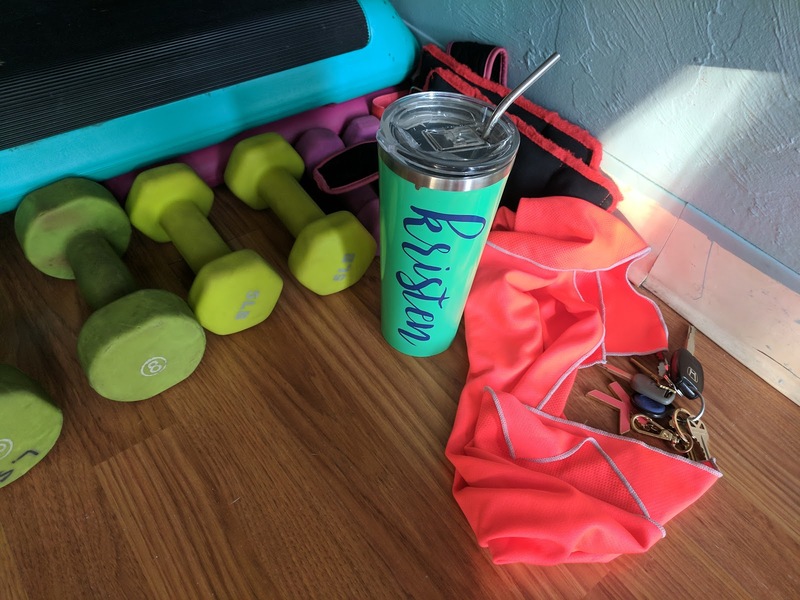 - Paying off some things really helped with that financial weight that we felt. There is a lot of relief that comes with not having to worry about extra payments. Paying off my car, and now not having a car payment at all, for example, has been amazing! - Decluttering was actually quite therapeutic. It was a project that gave me a lot of control back. When your world is crashing around you, it feels so good to have a handle on something. I went room by room, drawer by drawer and got rid of truly everything unnecessary. This also had some unexpected side effects like making it easier to clean the house and earning some extra cash with a big yard sale. - Buying less may have been a direct result of decluttering. I did not want to bring anything else in after getting rid of so much. This also really changed how I shop. I no longer go into Target just to walk around, I only go shopping if I need something. Browsing isn't really something I want to do anymore. Gosh, easier said than done. I have always chronically said yes to things I regret minutes later. People pleaser 101! If we were going to make changes, we had to become fiercely protective of our weekends. Although not effortlessly, we started saying no to invitations for social outings and parties more frequently. We used to feel obligated to go to every wedding, shower and graduation party of people that we didn't even know all that well. I've still said yes to things I probably shouldn't have, but less often than in the past and it has made the world of difference. 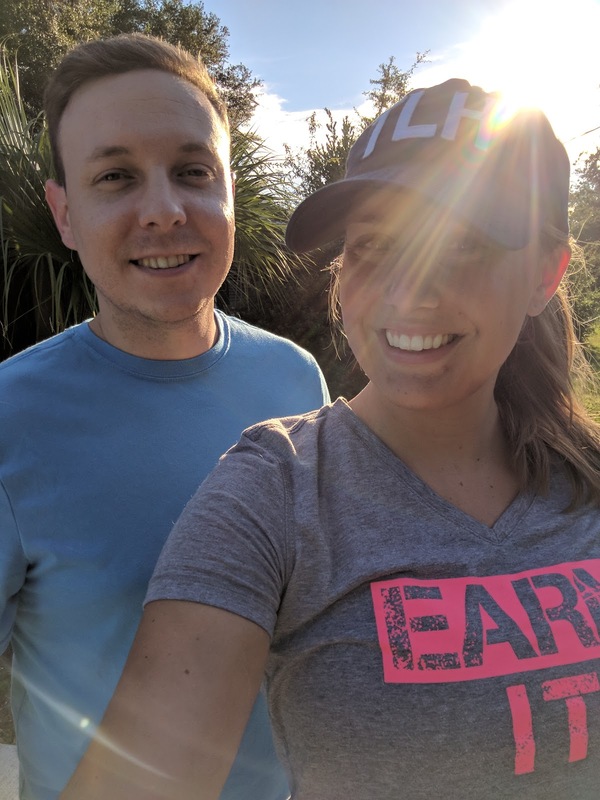 Since last November, we have only taken 2 trips- one was a quick weekend in Orlando, and we just got back from our annual beach vacation. Traveling is one of my favorite things to do, but we were doing a lot of it. A weekend at home was rare before, but now I have truly come to love being in my own home. Because let's face it-there is always something to do around the house or friends to have over for dinner. Maybe the hardest part of this whole journey. It's easy to keep doing something when you have emotions supplying your momentum! Even after you see those initial results of your efforts pay off it can be easy to slip back into old habits. For example, we paid off my car and it was (and is) still tempting to go and buy a new one. But, we just keep reminding ourselves how nice it is to have that extra money each month for other expenses. It was so cool to stumble on that post, because a year later I feel like a totally different person. My dad was diagnosed with cancer at the very beginning of the year, and while he is 100% healthy now, it was a jarring experience. But! 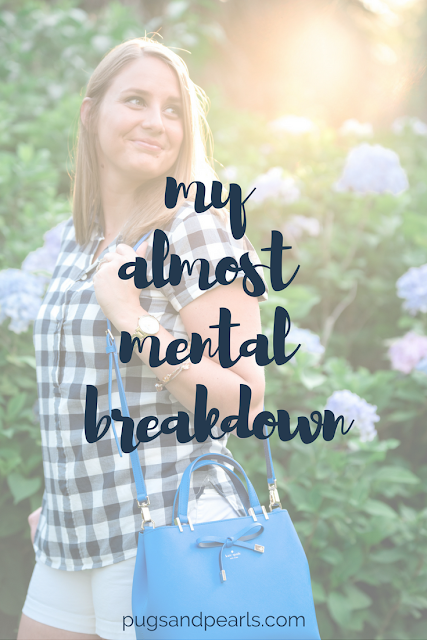 I was in a completely different mental state this year and more prepared to handle stress. Had that happened last year, I don't know how I could have made it through unscathed. Having a simpler schedule, lifestyle and mindset has completely changed everything for me! Examining your priorities is a good mental exercise for anyone. It's hard to change, and hard to give things up. Especially if you are like me and try to have it all, do it all and try to have a cute outfit on while doing it. Going against the grain is difficult. We live in a complicated world, filled with the push to have a lot of nice things and being different is not going to be easy. There is a lot of pressure to keep up and not feel left out. I actually stopped watching certain tv shows, unfollowed people on social media, and, again, quit going to Target to break myself of some of that thinking. But, here I am on the other side of all of that and I can't even begin to express how happy I am that I/we firmly resolved to make changes! Leave a comment below if you have ever had to make some serious changes in your life to prevent yourself from totally losing it! Have you ever felt like a completely different person after reflecting on a time in your past?